I was going to ride this 100 miles as my first ever 100 mile ride. It took me much longer than expected to find a saddle to fit both me and Miss Daizy. The treeless saddle I have been riding her in for the past three years was just not doing the job to my satisfaction. We were both getting “after ride” aches and pains from it. On my third attempt, I found the perfect saddle for us both. Our first official competition in “the new saddle” was at Ride Between The Rivers. Miss Daizy was on fire and loved the saddle. I need to put some more miles in it and get it broken in to me, it’s new and the leather is still working it’s way to suppleness…it made my knees ache towards the end of the ride. Since I already had the time blocked off my calendar for the NEC ride, I begged The Three Stooges to be their crew. I must have done a good job at Vermont because they agreed. YAY! Lindsey promised to crew for Team Dawn and Dean. We decided to drive up together and save gas money and share the long hours on the road. 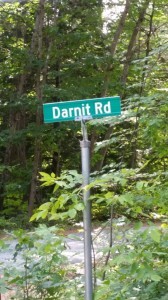 I am so glad I did because I really really enjoyed my drive up to Maine with Lindsey. We talked about everything and anything and the nine hour drive seemed like forty-five minutes. Even if we did take a detour through The Bronx to get to Maine. (Don’t ask) We didn’t have a horse trailer and the Dum-Dum GPS wanted us to go through NY to get to Maine (from Pennsylvania??? Really???) So we decided to take a tour of the New York skyline. We did a slight detour off a ramp we really shouldn’t have taken and VOILA! 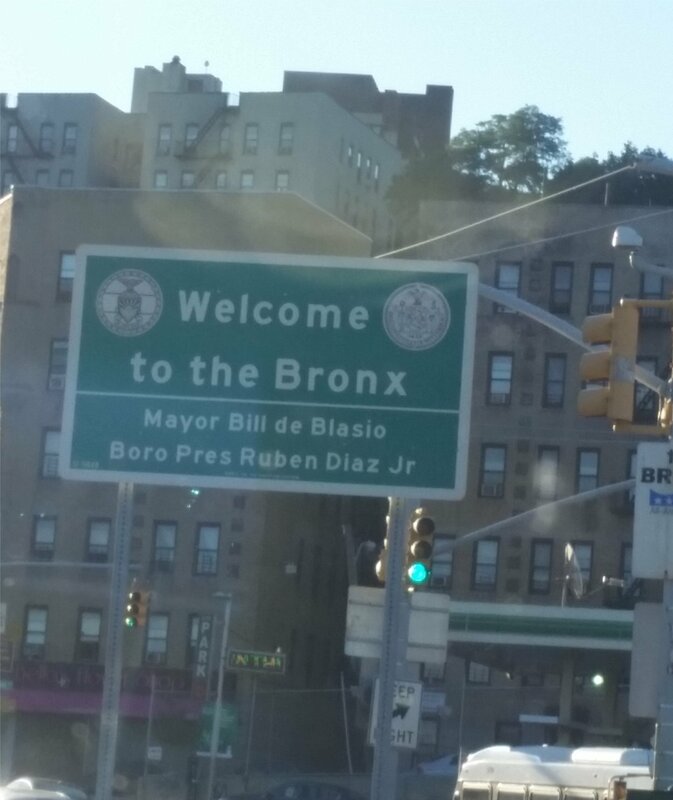 We shaved 22 miles, instantly, off the drive by going through The Bronx. Now to figure out how to shave 22 pounds off my belly. Hmmmm. Every time I crew, I learn something new to try for myself and Miss Daizy. This weekend’s crewing adventure netted not one, not two, not three, but FOUR new things. 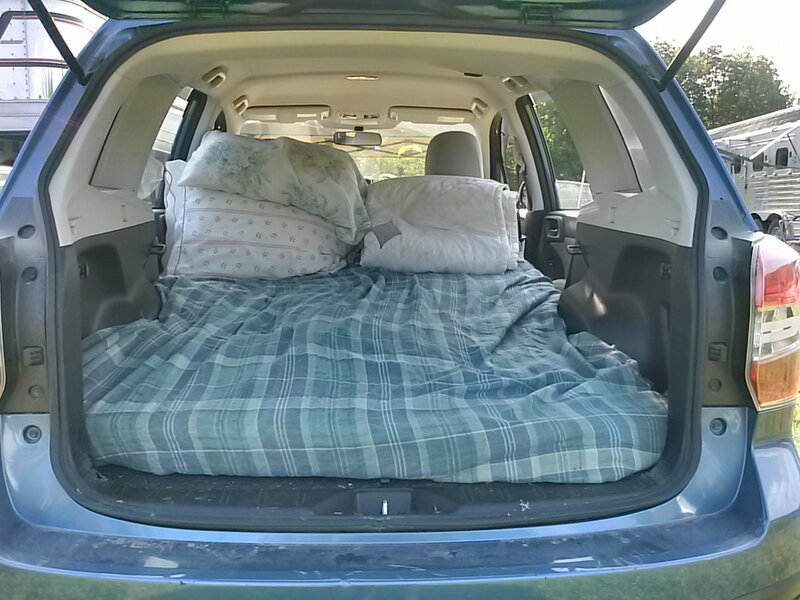 Second – when you have this nice bed setup in the back of your Subaru, all ready for a nice nights sleep before the ride, you might want to find out that the ride – which is all holds in base camp – has lots of Pit Crew stops out on trail BEFORE you set up the mattress and bedding. And you might want to bring along a tarp to put over the nice mattress and bedding BEFORE you throw in hay bags, grain bags, water containers, buckets, itchy face towels, etc etc etc. 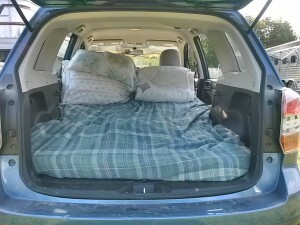 My Subaru looked like this before we started the day. This crewing adventure was a relatively easy one for me. Old Dominion and Vermont crewing can be tough because all the holds are away from base camp and once you leave base camp to go out on trail to crew you HAVE to be sure you have everything you need, may need, and anticipatedly need, in the truck before you leave because there is no going back. Well, you could go back but only if you want to take the chance that you’ll miss your riders. In the beginning, it was me for three riders. 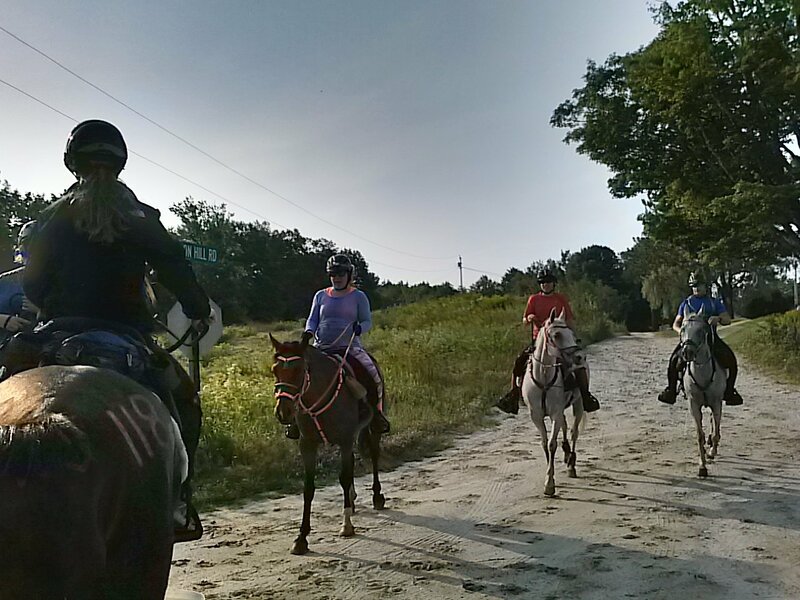 A little challenging, but these three riders are very self sufficient, especially for the first half of the ride. They pretty much take care of their needs and I’m there simply to fetch and tote and hold their horse for a moment or two. 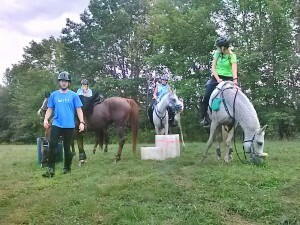 As they left out of each loop, I quickly setup three horses feed and cooling needs, refilled water tubs and organized the disaster left behind from three riders throwing stuff everywhere. Then, I’d truck the three of us (Jeff’s crew, Dawn & Dean’s crew, and Poe!) out to a PC and wait. I had lots of most excellent conversations all day! And fortunately had not one but two naggravators. At one point in the day, when it started getting overly warm, we dicded to go to the Buckfield Mall and get some ice. Now, I don’t have a picture of the mall itself so imagine a picturesque little trading post with a one pump gas station and a white gravel parking area … yep … that was the Buckfield Mall. 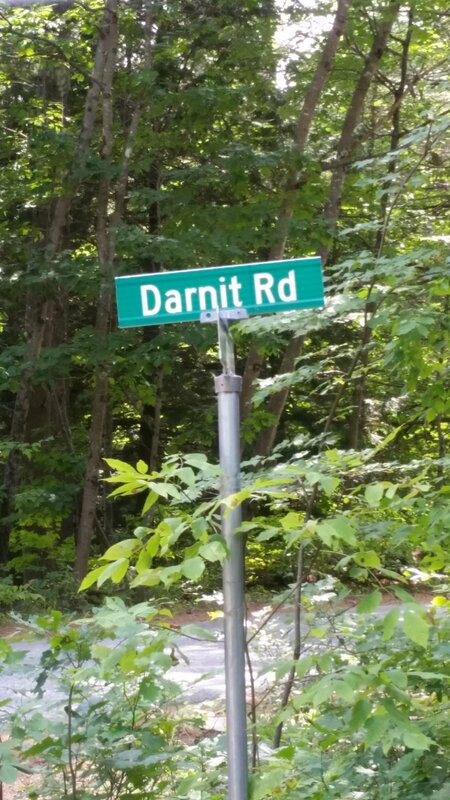 On the way back from the mall, I made a wrong turn and ended up on this road. And the mall did not carry synthetic oil for my Subaru who was begging for some. 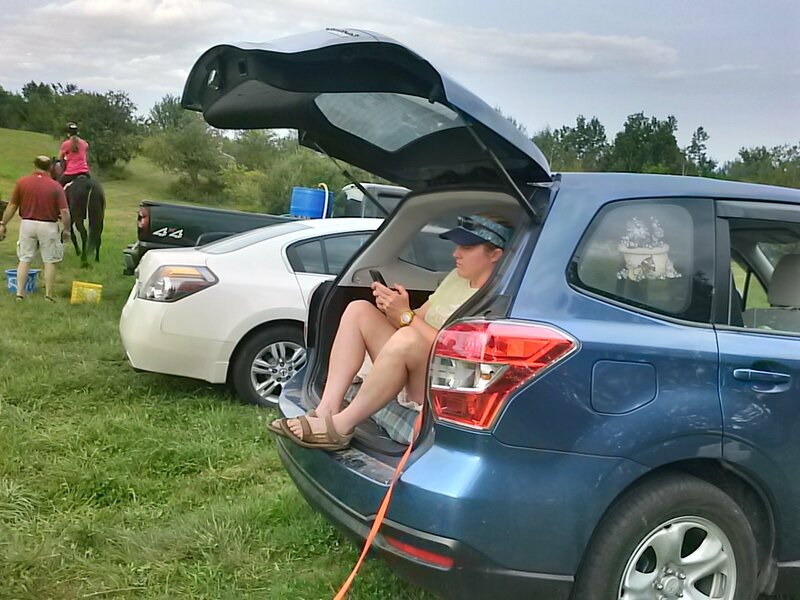 After our riders passed the PC, we’d load back up in the Subaru and drive back to base camp and wait. I also ate way too much food because we were sitting around a lot. Then after the hold was over and they went back out on trail, I’d do it all over again. I read eight chapters in my book when I didn’t have company in the hold. By the time night came, my one person crew turned into a two person crew. Lauren’s horse Getcha popped a splint and she did a Rider Option pull at mile 58. After taking care of Getcha and getting him setup, she started crewing for Melissa so now I have one rider to care for, Rowena and her horse Czar. My job just became very very easy! Unfortunately, now it’s dark and I have no way to read my book, so I broke out the Kindle and started reading a book on there. Made me sad because at chapter eight in my paperback book I was starting to get really into the story and I was anxiously awaiting the bad guy’s arrival. Soon, our little group of crew went from two to three as Lindsey joined us when both her riders chose to rider option out of the ride. I was really sad for Team Dawn and Dean but glad that they didn’t have any major injuries, just cramping in the rear end. Lindsey pretty much took over for Team Czar and I felt kinda useless for the rest of the evening every time they came into camp. Then I remembered I was the cheerleader so I just cheered and kept Czar’s bowl full. 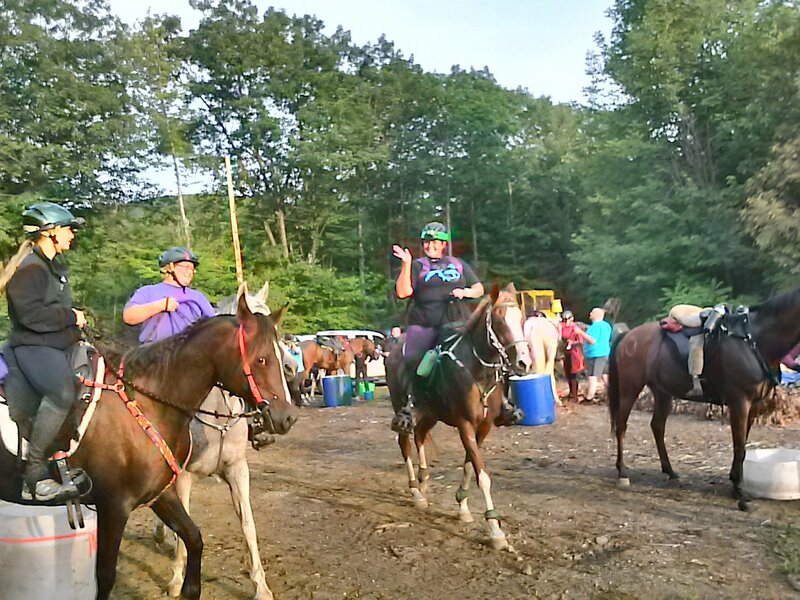 And then a 30 mile rider, new to the sport and full of questions about the sport and riding longer distances, came to our crewing tent and we now had three riders together (Rowena, Melissa and Jeff) with a total of seven crew people. Yep,. easiest crewing job ever! I was the oldest member of the crewing team (don’t go there) and yet I was the only one that stayed awake the entire ride while everyone else went and took naps. Now, this might seem bizarre considering that I am the one who likes to get to bed around 11 pm, but I had the most marvelous sleep the night before in the back of the Subaru that I simply was not tired and I was really enjoying the new book I started reading on my Kindle so … I watched as 100 mile riders came in and went out and had a very pleasant evening/night. I do have one more lesson to talk about, but it is an on-going lesson, and not a new one, which is the mind is very powerful. It can make or break a 100 mile rider. 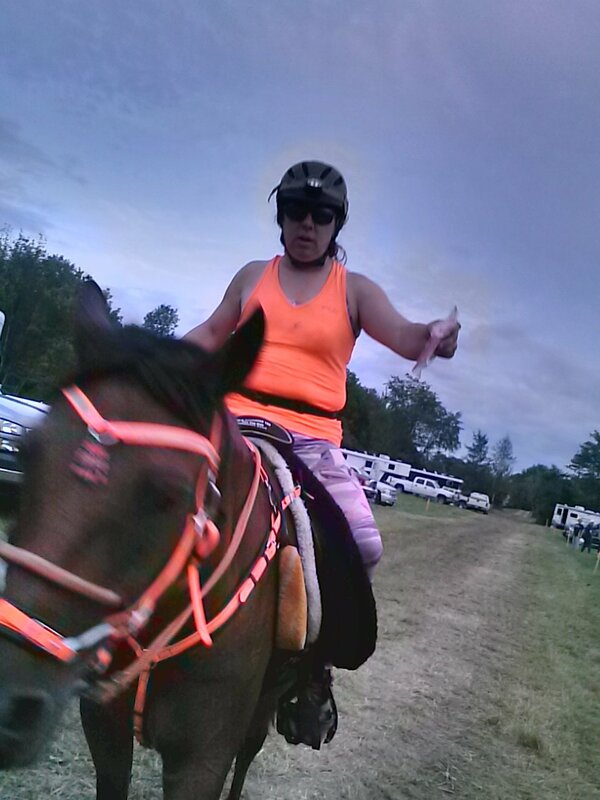 I truly truly want to send in a 100 mile entry, get on my horse and do it and my mind keeps finding all kinds of excuses why I shouldn’t do it. I absolutely know that Miss Daizy can do it and part of me wishes some experienced 100 mile rider would come along and ask to take her to a 100 mile ride and give her the experience, through their own experience. Then another part of me says, “NO! Do it yourself.” because I am very possessive of my horsie. She and I are a great team and I know that fact deep in my heart so I should be the one to take her through her first 100 mile ride. However (the mind) has other ideas about that as I watch the riders working so very very hard all day and into the night. I wonder if I have the mind power to stick with it as I get tired. I know that my body will not fall apart but my mind is beating me up. My lesson at this ride was watching Rich in action. He is in constant pain, whether he is riding or not, and that pain is a severe kind caused from nerve damage. I watched him at every hold get off his horse in a cheerful manner, smiling at his wife and crew, and hobbling over to his chair to sit and rest while they helped him out. I will forever keep this image in my mind when I set off for my own 100 mile ride because if he can do it, without ever complaining once, then I can do it! Rich finished first AND got BC for the NEC 100 mile ride. I might complain, though, so I just want to warn anyone that crews for me at a 100 mile ride … yes, I might complain. 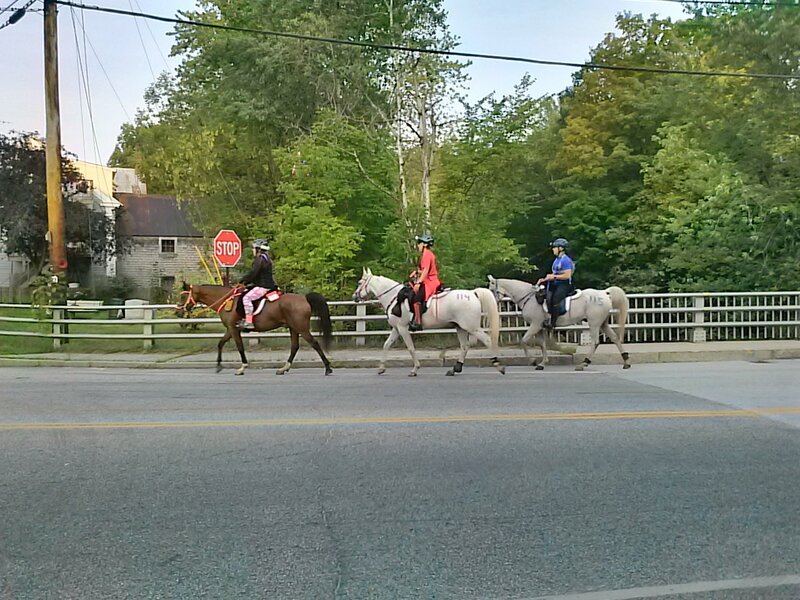 Crossing the bridge and riding through town in the morning on first loop. Jeff is riding a Chevelle Canadian. This is a drafty-type horse. 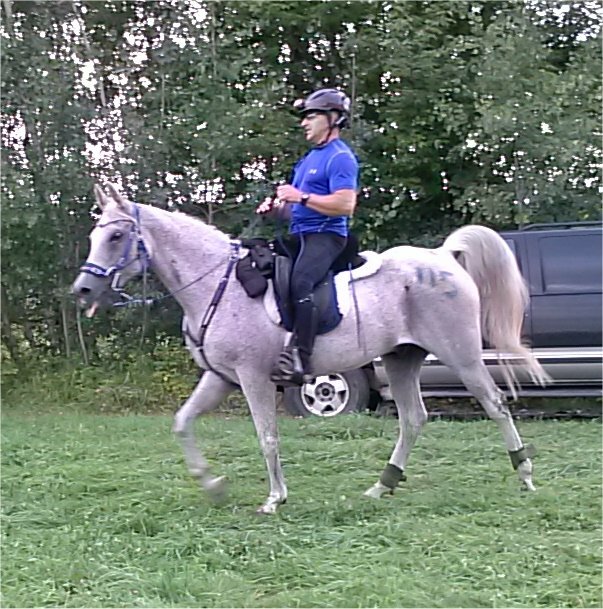 Big and bold and not a sleek Arabian! Yes, he is doing the 100 mile ride. 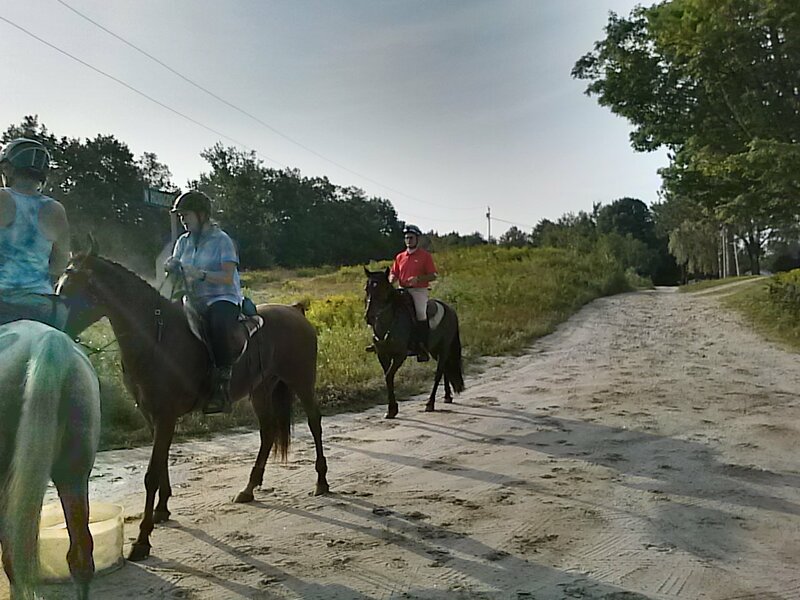 Yes, it is his first and his horse’s first 100 mile ride. Yes, they completed and I was part of his thrill as I had his wife, Mary Anne, with me all day in the official crew vehicle. The ten minute gate-n-go on the first loop. First loop was the longest at 22 miles. Everyone had Facebook access but me (sob) Lindsey in the back of the official pit crew car Facebooking! Even though Sultan looks fabulous in this photo, this is where Dean told us he didn’t feel right. we had him trot out and sure enough, he looked crampy in the back. Four mile to base camp on trail, or 1.5 miles down the road on foot. Dean got off and walked Sultan back to basecamp on the road. Last photos because it is getting dark and the camera just takes pictures of dew dops in the air.